Dar Lighting Blyton 3 light ceiling fixture displays a fun and unique design with a playful, DIY aesthetic. 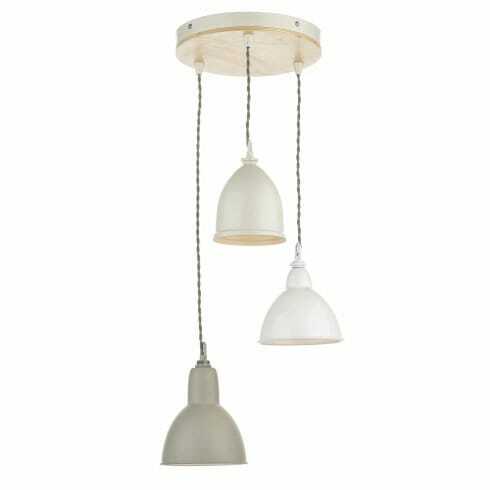 It circular ceiling plate with a wooden layer that supports three lamps from grey braided cable. The use of wood and coloured shades in tones of white, cream and grey, enhances the feeling of log cabin coziness, and forms a wonderful marriage of textures and finishes. The product code for this Dar Lighting fitting is BLY0343, this can be matched with the floor, table and wall lights in this range. Elegant and quietly rustic, this ceiling pendant will fill any space with much charm and personality, while its neutral colouring allows it to blend with many decors. This beautiful, shabby-chic range is also available as floor and table lamps, single light wall and ceiling fittings, and a three light bar pendant. All items are available to order from our website.